No appointments, service is on first come, first served basis. Humanities Nebraska speaker, Nancy Gillis, of Cherokee and Choctaw heritage will present two (2) different programs on Thursday, February 2, 2017 in North Platte. Gillis moved to Nebraska in 1987 to work with the Winnebago people for the Reformed Church in America. She also served as the Executive Director of the John Neihardt State Historic Site. Recycle cart collection is scheduled for every other week. Due to conflicts with the city observed holidays, the first week for February recycle pickup will be the week of February 9, 2015. The collection will be every other week thereafter. Please have your recycle carts placed out for collection at the start of the week to avoid being missed. Are you interested in serving on one of the Mayor’s Boards or Commissions? If you are interested, applications can be picked up in the Mayor’s Office. 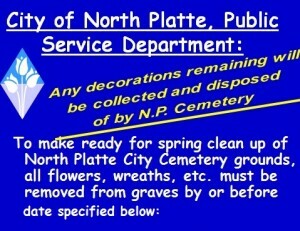 The City of North Platte is in need of people to serve! be removed from all graves on or before Monday, June 1, 2015, so that normal maintenance can be resumed. 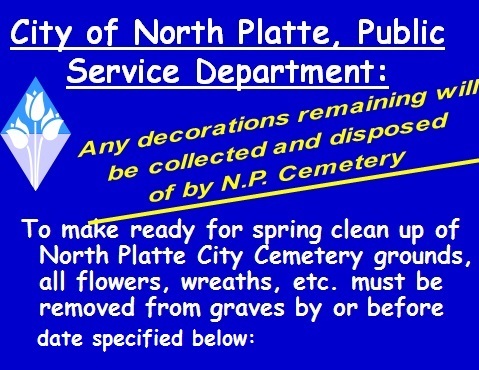 Flowers and decorations remaining on graves will be collected and disposed of by the North Platte Cemetery after the above specified date. If you have any questions, please call the Public Service Department at 308-535-6700. 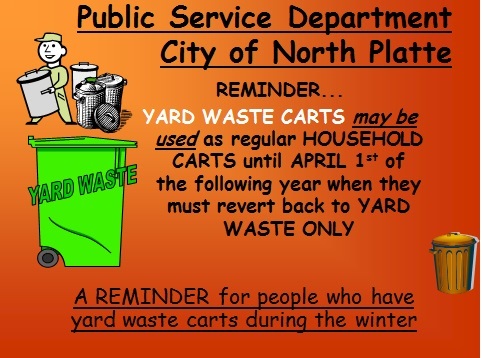 The City of North Platte, Sanitation Division, will start SEPARATE YARD WASTE COLLECTION April 1, 2015. 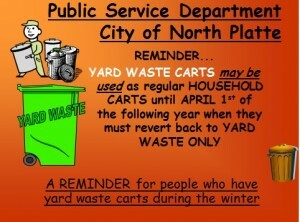 Residents of the City of North Platte must start separating yard waste from household waste. Yard waste must be placed in the container with the yard waste logo on the container lid, NO PLASTIC BAGS, HOUSEHOLD WASTE OR TREE LIMBS will be accepted in yard waste containers. NO YARD WASTE will be accepted in the household container until December 1, 2015.